11.3.2018 EPISCOPAL ORDINATION OF DERMOT FARRELL. 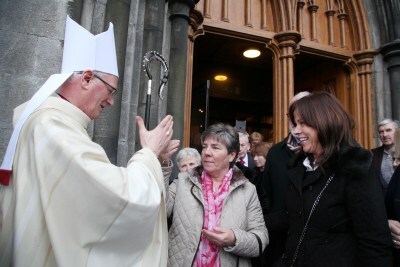 Last Sunday the Episcopal Ordination of Dermot Farrell took place in St Mary's Cathedral Kilkenny. The principal consecrator was Archbishop Diarmuid Martin, Archbishop of Dublin. Pic shows Archbishop Diarmuid Martin (Principal Consecrator) laying his hands upon the head of the candidate at the cermony on Sunday. Pic John Mc Elroy. NO REPRO FEE. The new Bishop of Ossory, Dr Dermot Farrell, has issued a strong pro-life message warning that to “extinguish the right to life of the innocent child” in the name of personal and civil rights is the “ultimate delusion”. He said there was “no such thing as a human life that has no value” and he prayed people’s eyes would be opened “to see the image of God in every child, at every stage of their lives”. Speaking to the media after the ceremony, which was presided over by Archbishop of Dublin Dr Diarmuid Martin and the papal nuncio Archbishop Jude Okolo, Dr Farrell described the right to life as the fundamental right on which all other rights are based. “If we don’t cherish that right you can’t talk about any other rights: personal rights or civil rights or political rights, because without life you don’t have any other rights,” he said. Bishop Farrell also challenged the Government on the homeless crisis, saying it should not be “an impossible dream to hope that no person, particularly no child, in this country would be left homeless or go to bed hungry”. He said he was not just referring to those in hotel rooms, but the country’s immigrants in direct provision. “With more than 3,000 children in this country who have no place they can call their home, with families who do not have a front door to call their own, who have no family table – do we not have an obligation to call those in political leadership, who hold power and carry responsibility, to act with urgency, for the well-being of our sisters and brothers?” he said. Asked to respond to former president Mary McAleese’s comments on misogyny in the Catholic Church, Bishop Farrell said her “questions come out of a conviction and a deep faith”. “I am reminded of a quip by Cardinal Newman who once said that the Church would be a very strange place without the laity – it would probably be an even stranger place without women,” he told the Irish Independent. On International Women’s Day, Dr Martin acknowledged that one of the most significant factors in alienating people from Church structures today is the place of women in the Church. He said Dr McAleese’s challenge to the internal culture of the Church “was brutally stark”. You may read the full report of Bishop Dermot Farrell’s episcopal ordination and sermon as published on the Diocese of Ossory website by clicking here. Previous articleMr Varadkar – We must also care for Ireland’s undocumented!